Here at Shape, we have amassed a wealth of knowledge & experience in all aspects of the design and build process. 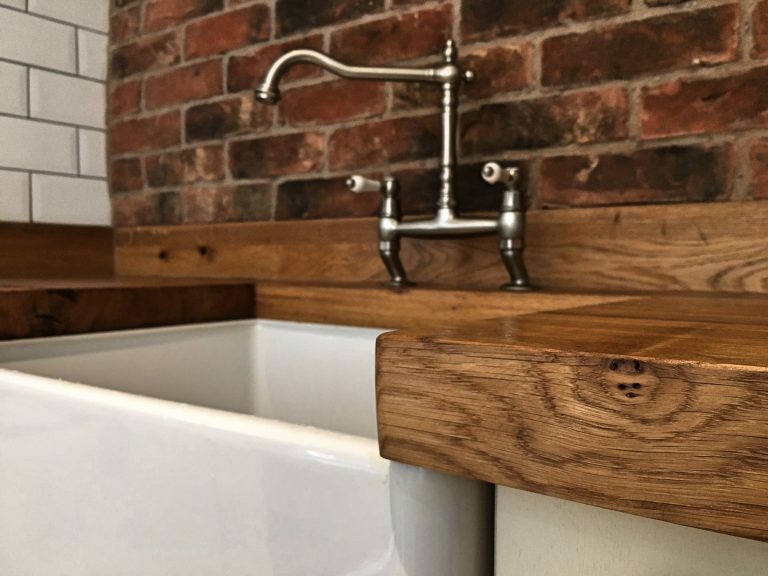 When it comes to fitting out a new kitchen, our team of designers, makers, joiners and fitters have an unparalleled collective knowledge about the pros and cons of a wide variety of materials, details and techniques, which we offer to our clients. As a company, we have decided it was time that we shared some of our findings, knowledge and experiences with the wider construction industry, and so here is the first installation in a many-part series, which we hope will help to give you the knowledge to enable you to make the right material choices for your next project. There are so many different options of kitchen countertops to choose from, with more innovations and advancements in new technologies each year. Choosing the right material is important as it has a massive influence on both the aesthetic and functionality of the space. 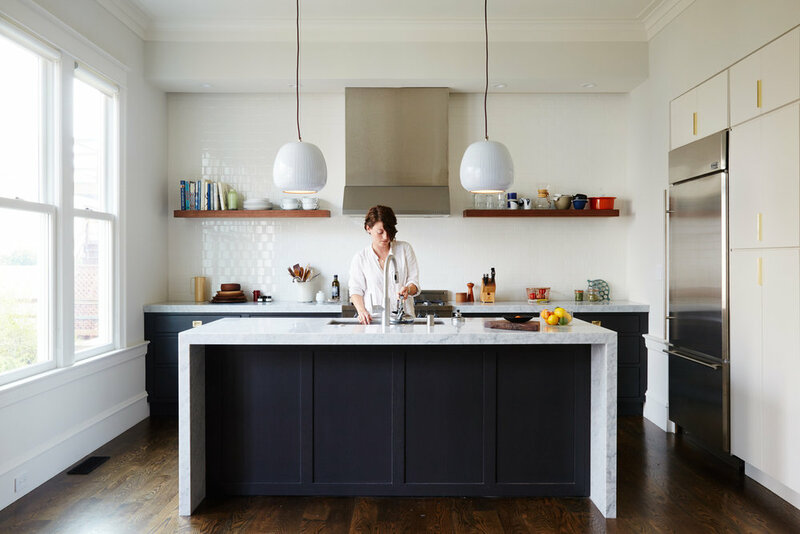 Below we have collated a selection of options for materials for kitchen countertops, including some benefits and drawbacks, cost, and trusted manufacturers and sources where we have purchased materials from. You can often find stockists of materials on the manufacturers’ websites. Whilst we have provided a ballpark price, these will vary between stockists, location, and grade of material that you choose. Solid surface countertops are artificially-made, composing of natural mineral fillers and resin binder. It looks, feels and performs incredibly similarly to natural stone, however it allows for an increased flexibility in design freedom. Whilst it requires a trained professional for fabrication and installation, slabs can be bonded and curved to create a virtually seamless finish, offering the greatest design freedom out of all the materials discussed. Suppliers & Manufacturers: Corian, Hi-Macs, Avonite, Swanstone, Staron, Living Stone. Maintenance: No specific action needed. 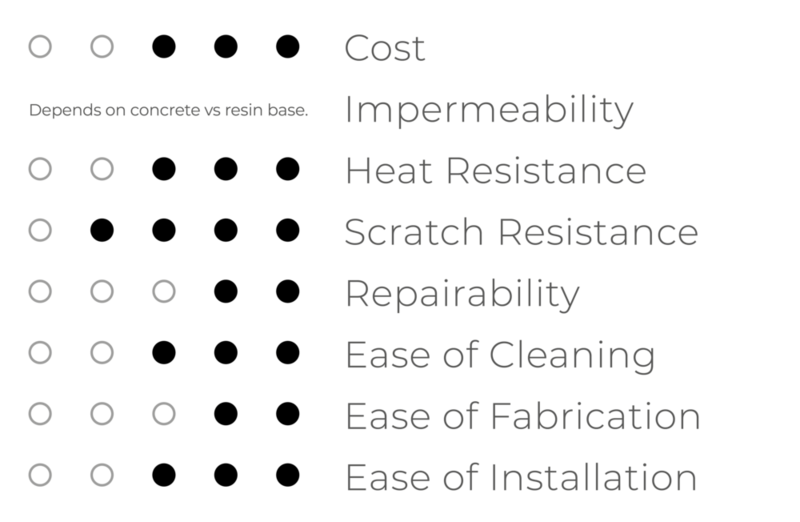 Paper composite worktops are formed by paper or wood fibres are mixed with non-petroleum based resins, resulting in a good eco-friendly alternative to solid surfacing. They can be joined show that seams are minimal, they’re easy to install due to their reduced weight. Although they are non-porous, various substances can cause slight discolouration, so they develop a faint patina over time. 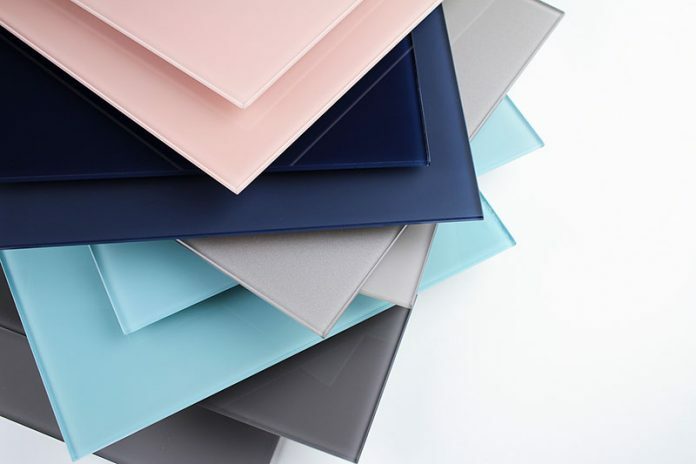 As they are a man-made material, they come in a wide variety of colours and finishes, varying between manufacturer, although, as a relative newcomer to the market, suppliers are currently fairly limited. Image source: Richlite via Remodelista. Suppliers & Manufacturers: Richlite, Paperstone. Cost: £250 - £600 / sqm. Maintenance: Alkaline soaps and bleach can dull or discolour the surface, and annual application of mineral oil is recommended. Typically, Quartz is manufactured by combining leftover crushed granite, marble and actual quartzite, which is then bonded with a resin, polymeric or cement-based binder. 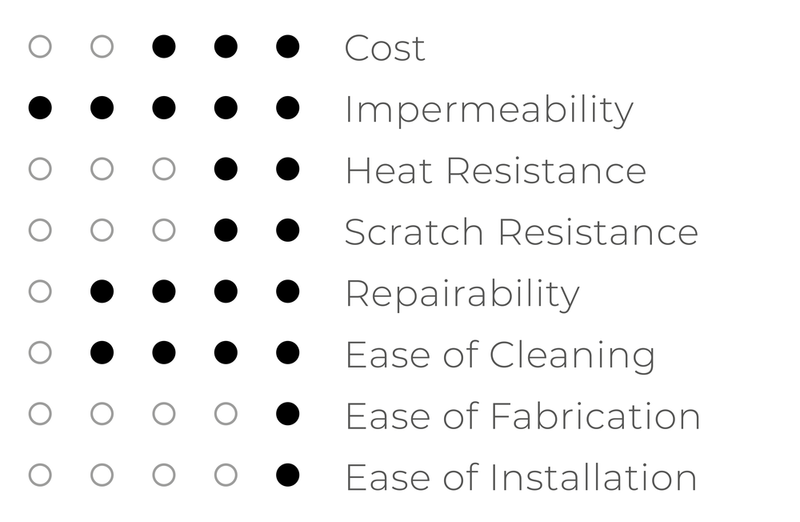 The manufacturing process results in a much harder product than solid surface materials, with pre-cut slabs typically being delivered on site ready to fit. It is a more cost effective alternative to granite or other natural stones, and whilst it offers a similar aesthetic, there is a greater variety and consistency in colours and finishes on offer. Suppliers & Manufacturers: Randianz, Silestone & Caesarstone. Cost: £120 - £900 / sqm plus approx £900 for manufacture and installation. Terrazzo is typically an eclectic and customisable mix of marble, ceramics and glass, set together with epoxy or concrete. Tradition cement-based terrazzo is less durable compared to the latest resin-based terrazzos, which are more durable and less porous, however more costly. We find that a terrazzo kitchen countertop can be a superb option if you want the kitchen work surface to be the main feature of the room, and it is currently having a resurgence in popularity amongst the design community. Suppliers & Manufacturers: Diespeker, Dzek & InOpera. Cost: £75 - £500 / sqm, dependent on customisation. Maintenance: Resin-based - No specific action needed. Concrete-based - Yearly sealing is recommended. Frequently used in commercial kitchens due to its hygienic nature, a stainless steel countertop is a low-maintenance option to have in a home. Easy-to-clean, durable, resilient, acid-proof, stain-free and heat-proof, once installed they are incredibly low-maintenance. They do mark and scratch easily however, which develops into a patina over time, so this should be incorporated into the aesthetic design of the space. Image source: Cesar New York. Cost: £400 - £700 / sqm. Image source: Matt Watts via Home Adore. These metals are softer than stainless steel, and also react with a multitude of substances, such as acidic liquids. 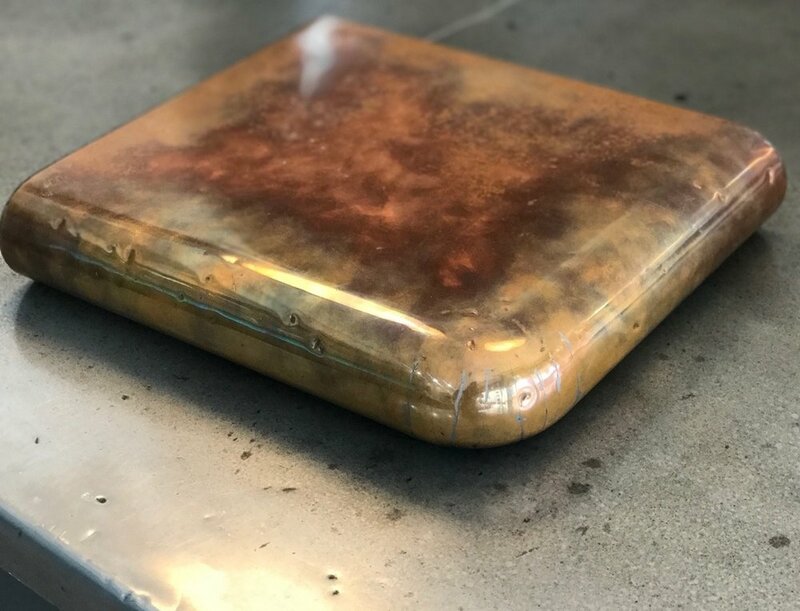 As a result, they can be seen as a warmer alternative to stainless steel, as they are a ‘living metal’ that each develops its own unique patina. An initial clear coat can reduce this staining, or polishing and sanding with a fine grain sandpaper can reduces the appearance of scratches.These metals are hygienic kitchen surfaces as they are non-porous, easy to clean, and all have natural antibacterial properties (these are nullified if a top coat sealant is applied). Granite is the standard to which all other kitchen worktops are held to, and for good reason as it is one of the most durable natural stones. It is resistant to heat, stains and scratches, and is easy to clean. Different colours are available, however these are limited to what occurs naturally, which also means that each slab is unique. As it is a natural rock, it should be sealed properly from the manufacturer that you purchase it from, and then it requires annual resealing to prevent staining from citrus and acidic liquids. Suppliers & Fabricators: Surrey Marble & Granite, Cullifords, The Marble and Granite Centre, Stoneworld. Cost £350 - £1000 / sqm. Often confused with quartz (which is a man-made material), a quartzite countertop is a slab of natural stone. It is a good choice if you like the look of marble but a client would prefer a lower maintenance alternative. In terms of durability, it is harder than granite, and is resistant to etching, scratching and heat. However you must be cautious as both soft quartzite and true quartzites are on the market. Soft quartzite still makes for an excellent countertop, as its is beautiful and is easy to care for (and often just mislabeled marble), however it will also need sealing to help keep it looking its best. True quartzite should not need sealing. You can tell whether a material is soft or true quartzite by using a tile of glass. If you scratch the materials together and the glass is scratched, then you have true quartzite. If however the quartzite is scratched, then you have a soft quartzite worktop. Cost: £500 - £1000 / sqm. Maintenance: True quartzite requires no specific action, soft quartzite requires annual or bi-annual sealing. Image source: Elizabeth Roberts Architecture & Design. Onyx is a solid mineral, and thus is a very soft material, so will scratch, scrape and etch with acidic foods and liquids. It is also not scorch proof and requires frequent sealing to protect its surface. Whilst it’ll be the showstopper of any room, it is best suited on a worktop that sees very little to no use, functioning as an aesthetic centrepiece rather than a practical countertop. Image source: MKW Surfaces via Pinterest. Cost: £800 - £1250 / sqm. Maintenance: requires annual to bi-annual sealing, but with typical kitchen use it might need more. Image source: Max Space Stone Works. Pure white marble retains its popularity in high-end kitchens due to its durability and scorch-resistance, but mostly it's timeless look. As it is a porous rock, it should be sealed properly from the manufacturer that you purchase it from, and then it requires yearly resealing to prevent staining from everyday use. This also means that it is a relatively high maintenance rock, as it can scratch and etch more easily compared to granite. Carrara marble has more ‘imperfections’ (softer viening) thus reducing its price, however we love the look of this material just as much. Suppliers & Fabricators: Surrey Marble and Granite, Cullifords, The Marble and Granite Centre, Stoneworld. Cost: £900 - £1500 / sqm. Image source: Amy Bartlam via Home Polish. Soapstone is extremely durable, non-porous, impervious to chemicals, and resistant to staining and scorching. It is sits in between marble and granite in terms of durability, however as it is a softer rock, it is not brittle and thus resistant to cracking. It varies across shades of grey with minimal veining, which gives this stone a distinctive look and makes it a bold and stylish choice for any kitchen. However as it ages, its colour changes, and it must be oiled regularly to ensure that it ages evenly and is not affected by watermarks. Image source: Justine Hand via Remodelista. Cost: £500 - £1250 / sqm. Maintenance: Whilst it is non-porous so does not require sealing, it is recommended that it is oiled every 2 months (or whenever water stops beading on the surface). Image source: House & Home. Limestone countertops come in many muted neutral shades which can be excellent to offset a bold colour palette elsewhere in the room. Travertine is a popular choice due to its resemblance to marble, and its famed use in the Colosseum. As a sedimentary rock, it is porous, and so makes it a higher maintenance choice within the kitchen. It requires regular sealing, and even with this it will probably not withstand staining from acidic liquids. It also can scratch, is not heat resistant, and certain cleaning products should be used with care. In a kitchen with minimal use, or if you are aiming for a Romanesque aesthetic, and have clients who are committed to caring for this stone, it is one of the most affordable options for a natural stone worktop. Image source: Cakning Home Design. Cost: £60 - £290 / sqm. Maintenance: Limestone worktops should be sealed annually, or when water no longer beads on the surface. When cleaning the countertop, a cleaner with a neutral pH should be used. Slate is a surprisingly common worktop material, and its natural mottling can make it a beautiful choice for a kitchen countertop. It has a more subdued colour, and works well if you’re wanting the countertop to complement other bolder stylistic choices in the room without it stealing the spotlight. It is non-porous, stain and bacteria resistant and durable, and often less expensive than its other natural stone counterparts. However due to its natural texture it is brittle and solely matt, and without the right finish it can have a gritty texture and sharp edges. Most professionals recommend rounding off the corners to prevent this. Image source: Wolf Projects via Pinterest. Cost: £400 - £550 / sqm. Maintenance: Although slate is one of the more durable stones, to keep it looking its best it is recommended that you reseal it every few years. This is one of the most common wooden countertops, made of individual wooden strips bonded together into a slab. As it is a natural material, the wood will absorb liquids which can grow mould, warp or stain when exposed to prolonged contact with water or high humidities, however regular sealing can help prevent this. Whilst it is easy to clean, it is a softer material so can dent easily. If properly cared for, it can last over 20 years, and is one of the most affordable wooden worktops. 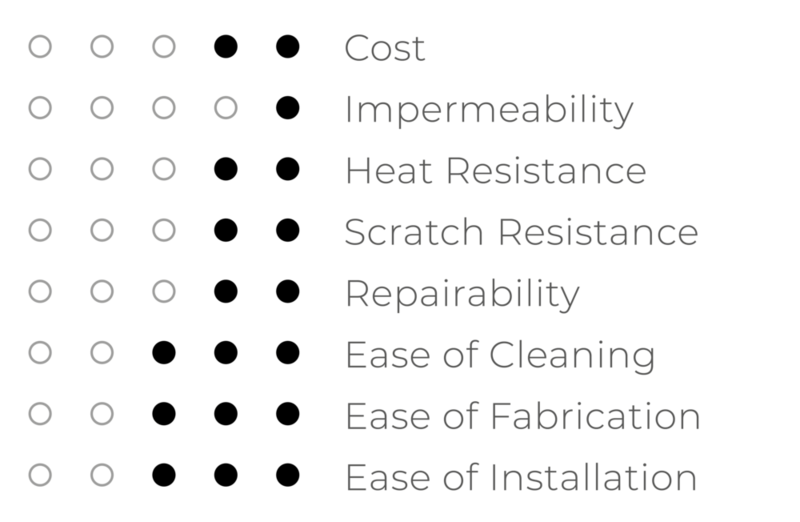 It can also has one of the lowest installation costs of any material on this list as it requires no specialist equipment. Image source: Aquarius Home Improvements. Cost: £100 - £300 / sqm. Maintenance: Due to its porous nature, ideally a wooden countertop should be sealed every 2 months, depending on usage. Image source: Black Rok Kitchen Design. A full stave worktop is very similar to a butchers block in the way that it is made, by bonding multiple planks of timber together to form the slab. However the key difference is that whilst a butchers block is made from smaller pieces of wood, a full stave is made from much larger pieces of wood (the plank of wood is called a stave). By having bigger pieces of timber, more of the grain is visible and so it can be argued that it adds more personality to the timber. 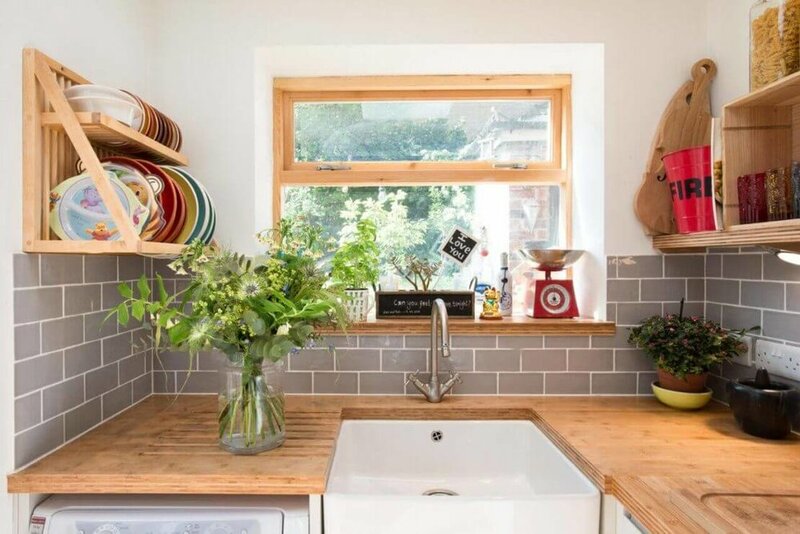 In terms of care and durability however they are on par with each other, however a full stave worktop is often slightly more expensive than a butcher block worktop. Cost: £250 - £500 / sqm. Image source: Rock my Style..
End grain countertops are made by bonding together wood blocks side on, so that the ends of grain are visible as the grain is running perpendicular to the surface of the counter. These are highly popular stylistic choices due to their unique look that will make the worktop a centrepiece to any kitchen. They evolved from a traditional butchers chopping block, and as a result are the most durable of all the wooden countertops. Due to the increased labour required to produce these, they have a higher associated cost. Supplier & Fabricator: Norfolk Oak. Cost: £300 - £700 / sqm. Maintenance: Due to its porous nature, ideally a wooden countertop should be sealed every 1 - 2 months, depending on usage. A reclaimed wood countertop can add personality to a space, and rustic unrefined edges are popular in some settings. For a usable surface it is best to consult a professional in restoration of timber. It is essential that these worktops are properly treated to make them suitable for food preparation. Image source: House & Garden. Cost: £150 - £300 / sqm. 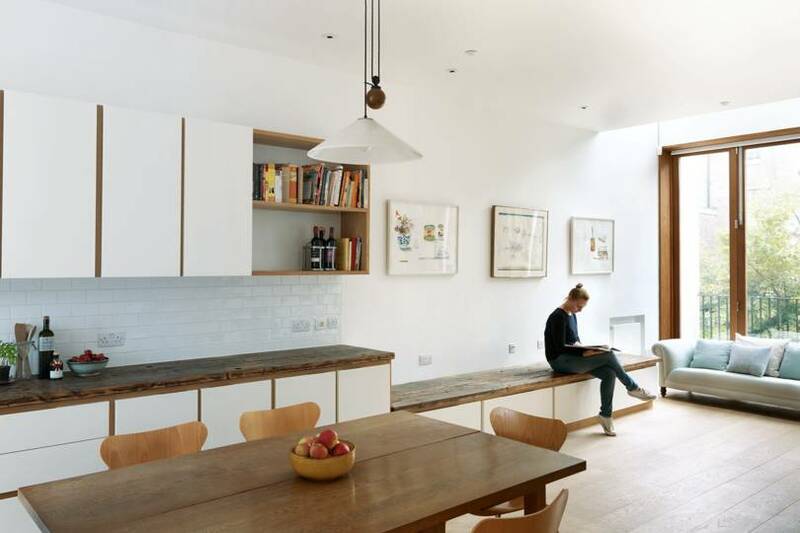 Image source: House & Garden..
Bamboo worktops are made in much the same way as plywood - shredded fibres mixed with resins. They have long been used in flooring however recently they are transitioning into worktops. Bamboo is a good option for a countertop for the environmentally conscious, as it is actually a grass, thus extremely fast growing, which means that it is a more eco-friendly alternative to a solid hardwood countertop. As it is mixed with resins, it is also more durable and resistant to scratches and dents than normal wooden worktops. However, the resins used to bond it can sometimes excrete chemicals, so be sure to source any bamboo work surface from a certified stockist who guarantees that it is safe to be used in a food preparation environment. Image source: Sheffield Sustainable Kitchens. Maintenance: Due to its porous nature, ideally this countertop should be sealed every 2 months, depending on usage. Image source: Sheffield Sustainable Kitchens..
Glass countertops can either be a sheet of glass or thermoformed, and back-lit with LED lighting to add to the overall effect. In day-to-day use, glass kitchen countertops clearly show dirt and fingerprints, but are a good option as they are non-porous, thus they are hygienic, easy to clean and stain-resistant. 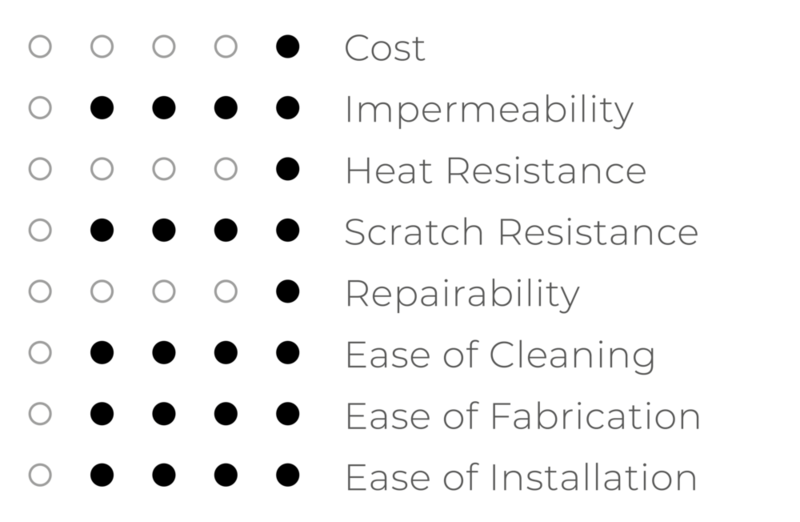 However due to the fragile nature of the material they can easily break during installation and can scratch and chip under heavier daily use. If they are tempered, it can increase their durability by up to 500%. Cost: £200 - £600 / sqm. Maintenance: No specific action needed with everyday use, however car must be taken as glass can scratch and chip, and is not repairable. A recycled or crushed glass countertop varies from a glass countertop in the fact that is an engineered surface, comparable to terrazzo. 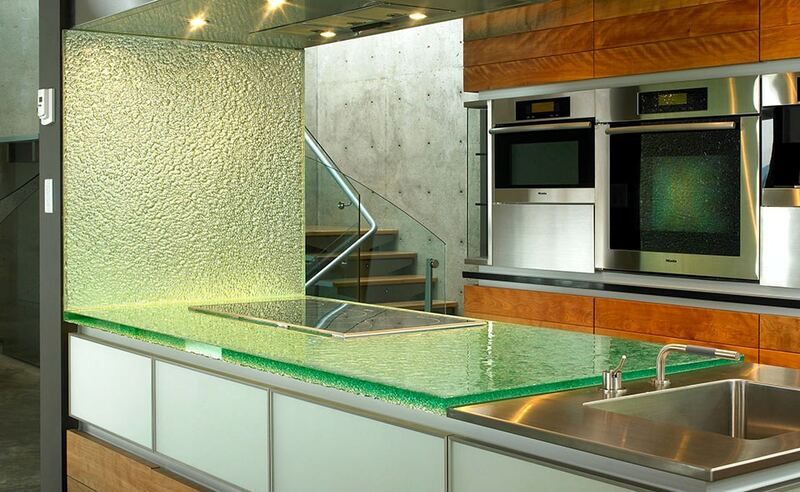 Glass fragments in a variety of sizes are combined with a resin or cement binder to form a new hard-wearing material. If a cement binder is chosen, as with terrazzo, a sealant will need to be applied every so often. Some reports say that pieces of glass can chip out/off, particularly around the edges, however proper care and sealing should prevent this. Suppliers & Manufacturers: Vertrazzo & UrbnRok. Cost: £75 - £400 / sqm. 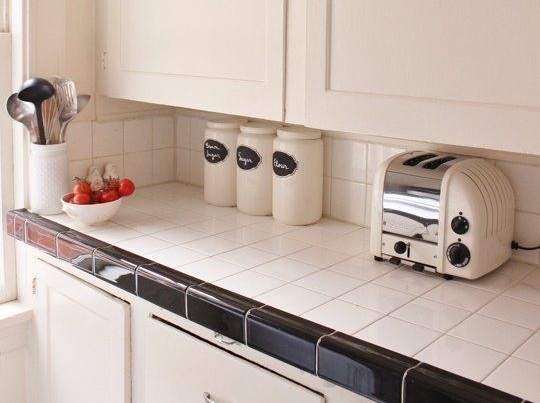 White glass is manufactured in a slightly different way to other glass countertops, as whilst it is a solid glass, it is manufactured using a mix of glass and silica, which is then heated to extreme temperatures. The resultant worktop is similar in appearance to Quartz, but is more durable. 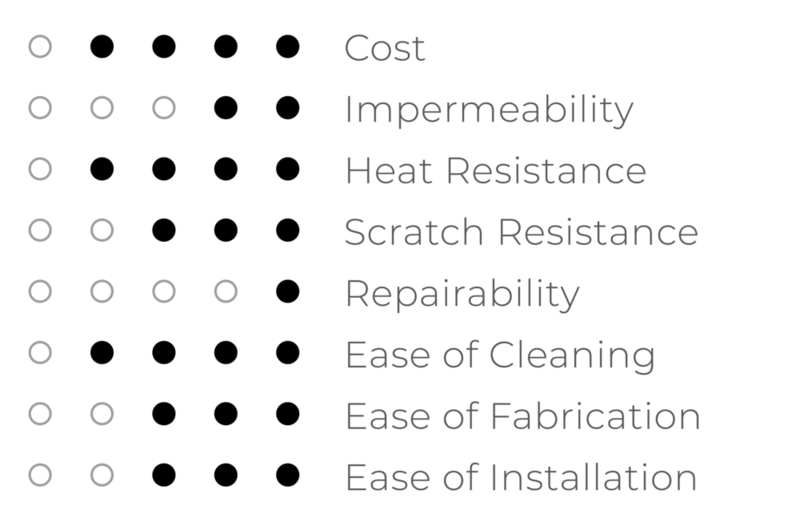 Due to the specialist equipment required to manufacture white glass, it is one of the most expensive materials and is the hardest to source on this list. Cost: £1,200 - £2,100 / sqm. 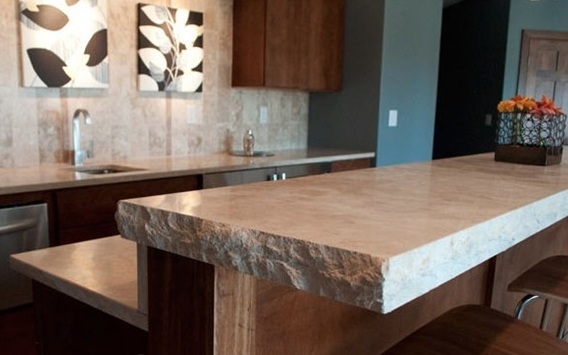 Image source: Haifa Limestone via Houzz. A solid ceramic worktop material typically combines quartz, clay and kaolin into a liquid ceramic that is then injected into a mold, dried, then fired at extreme temperatures. 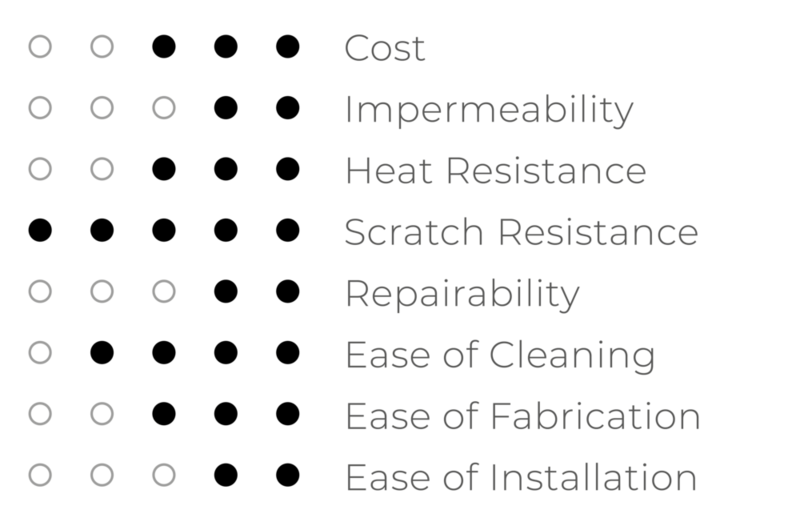 The resultant worktop is incredibly hard-wearing, and comes in a variety of finishes that can mimic natural stone.Whilst it is the most durable material on this list, due to its recent emergence as a viable material choice, the cost and availability of ceramic can be prohibitive. Suppliers & Manufacturers: Dekton, Neolith & Ceralsio. Cost: £500 - £1500 / sqm. Due to the weight of concrete slabs, often worktops are poured on-site, allowing for flexibility in shapes and sizes, and resulting in an unbroken finish across the entire countertop, although they can also be shipped pre-cast. Due to their weight, drop-front edging is often used to make them look thicker than they are. Concrete can also have a variety of finishes such as polished, raw, etched, stamped, sealed and acid-stained. Although concrete can offer a cool, raw aesthetic, they also can be adapted to be a warm, contemporary alternative to traditional stone slabs. Whilst the concrete is heat-proof, it is also porous, thus requires a sealant that can discolour with direct exposure to high temperatures. 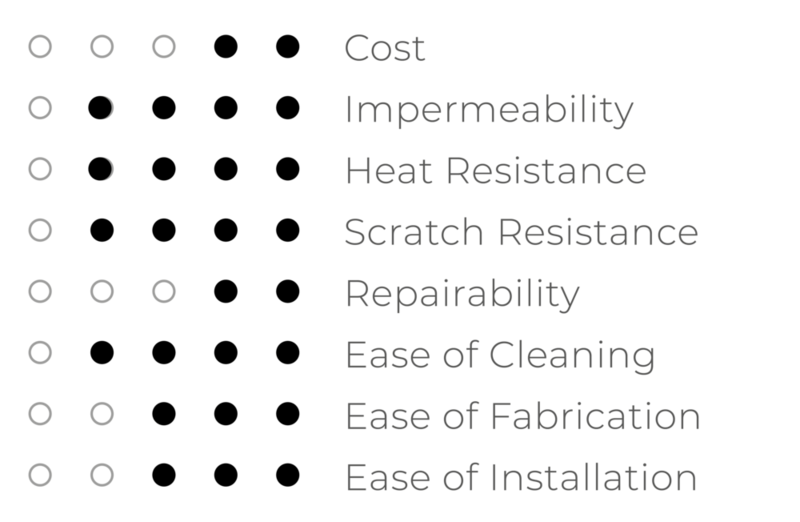 They also require a 28 day curing process, which might be worth keeping in mind whilst budgeting/programming for a project. Cost: £100 - £1000+ / sqm dependent on whether undertaken in-house or poured by a professional in situ. Maintenance: Requires annual or bi-annual sealing. Ceramic tiles are a cost-effective option if you want an eclectic or rustic aesthetic. You must be sure to seal any grouting between the tiles however, as these can trap dirt, and if not properly sealed, can allow bacteria to build up. Whilst they are easy to install, if they are not properly supported, or heavy cookware is dropped, they can crack. Porcelain tiles are more durable and come in larger sizes, so can have fewer seams and allow for easier cleaning. 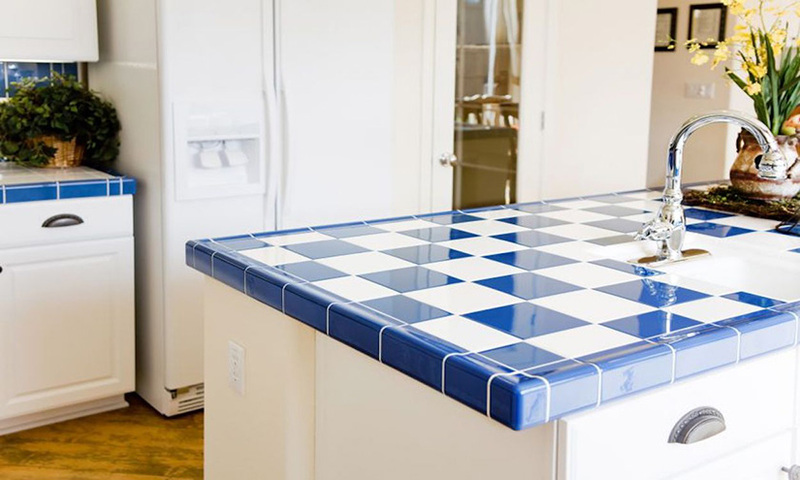 Using reclaimed tiles can lower a worktop’s environmental impact. Image source: Kitchen Cabinet Kings. Suppliers: Mandarin Stone, Alhambra Tiles Ltd & Bahya Tiles. Cost: From £20 / sqm. Maintenance: Whilst the tiles are non-porous, the grouting can harbour bacteria and grow mould, so should be properly sealed ever 6 months. Image source: Maura via Apartment Therapy. If none of the above options are within budget, then you can achieve the aesthetic of any of the above without the cost. Whilst laminate is the cheapest option, with high-quality finishes now available, new technologies allow laminate kitchen surfaces to look, feel and perform better than they have ever done in the past. An ever-widening expanse of colour and material choices mean than you can get the perfect aesthetic in any kitchen for a fraction of the cost. Image source: A. L. Robinson Luxury Worktops. As a company, Shape typically works in collaboration with Architects, Interior Designers, Contractors, or with clients on large-scale renovation projects. For questions and enquiries, please contact us via the ‘Get in touch’ button at the top and bottom of the page, or over any of our social media.